As Autumn approaches, we are coming into a full season of qualitative market research conferences. At Observation Baltimore, we like to call this period “Conference Season”. They’re great events to attend if you want to see old friends, meet new clients, and learn what’s new in the market research industry. 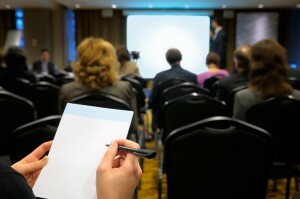 Each conference has a different focus, but they all are sure to bring value to the attendees. QRCA. October 16- 18, San Diego, CA. The Qualitative Research Consultants Association is a conference focused on cutting edge qualitative research. This conference will keep you current on the rapidly changing market research landscape. At the QRCA conference, you will gain access to a global network that includes roughly 1,000 independent qualitative research consultants with great expertise and knowledge on market research projects. Click here to learn about the QRCA conference. Corporate Researchers Conference. October 16-18, Dallas, TX. The Corporate Researchers Conference, also known as CRC, is a conference designed for corporate researchers. During the conference there will be 50 speakers and 34 educational sessions to offer insights on corporate market research. If you attend this market research conference, the Marketing Research Association (MRA) will provide you engaging content to help your business do research more effectively. Here is a list of speakers that will attend the conference. The Market Research Event (TMRE). October 21-23, Nashville, TN. At this conference you can expect “more proven value” than any insights conferences can offer in the market research industry. More than 1,000 participants will be at TMRE. The primary focus of this conference is on the business value of research and insights. The goal of the conference is to transform market researchers into strategic, consultative leaders by reviewing best in class business cases and teaching researchers valuable skills such as data visualization, storytelling, and strategic thinking. Learn details about TMRE speakers and the market research event now. Qualitative Health Research (QHR) Conference. October 27-29, 2013, Halifax, Nova Scotia, Canada. This is an excellent conference for those in the health care industry. The QHR conference will focus on the diversity of disciplines, philosophies, and theories related to health care qualitative research. This conference will be held at the Halifax Marriott Harbourfront Hotel. Observation Baltimore will be attending QRCA, and we look forward to hopefully seeing you there. If you can’t make it, we hope that you will attend one of the other conferences. Do not miss out on some of the greatest innovators and creative thinkers in market research! This entry was posted on Wednesday, September 4th, 2013 at 5:52 pm. Both comments and pings are currently closed.